The Q5 High-Fidelity 2X Master Mix offers robust, high-fidelity performance in a convenient master mix format. The Q5 High- Fidelity 2X Master Mix features a high-fidelity, thermostable DNA polymerase with 3´→ 5´ exonuclease activity, fused to a processivity-enhancing Sso7d domain to support robust DNA amplification. With an error rate ~280-fold lower than that of Taq DNA Polymerase, Q5 High-Fidelity DNA Polymerase is ideal for cloning and can be used for long or difficult amplicons. The convenient master mix formulation is supplied at a 2X concentration. The mix contains dNTPs, Mg++ and a proprietary broad-use buffer requiring only the addition of primers and DNA template for robust amplification regardless of GC content. When used at the recommended 1X final concentration, the Q5 High-Fidelity Master Mix contains 2 mM Mg++. Q5 High-Fidelity DNA Polymerase is unlike typical, lower fidelity PCR enzymes. To determine the optimal annealing temperatures for a given set of primers, use of the NEB Tm Calculator is highly recommended. Q5-High Fidelity 2X Master Mix formats allow robust amplification of a broad range of targets with a single formulation. 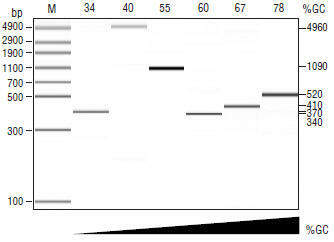 Amplification of a variety of human genomic amplicons from low to high GC content using Q5 High-Fidelity 2X Master Mix. All reactions were conducted using 30 cycles of amplification and visualized by microfluidic LabChip® analysis. A precipitate (most noticeable after the first 1–2 freeze/thaw cycles) is not uncommon. To ensure optimal performance, the master mix should be thawed and resuspended prior to use. Stability testing using up to 15 freeze/thaw cycles has shown no negative effect on master mix performance. Product specifications for individual components in the Q5 High-Fidelity 2X Master Mix are available separately. Anastassia Voronova Erin Coyne, Ashraf Al Madhoun, Joel V. Fair, Neven Bosiljcic, Catherine St-Louis, Grace Li, Sherry Thurig, Valerie A. Wallace, Nadine Wiper-Bergeron, and Ilona S. Skerjanc. (2013). Hedgehog Signaling Regulates MyoD Expression and Activity. J Biol Chem. 288(6), 4389–4404. Hicham Bouabe, Klaus Okkenhaug (2013). A Protocol for Construction of Gene Targeting Vectors and Generation of Homologous Recombinant Embryonic Stem Cells. Methods in Molecular Biology. 1064, 337-354. How should I set up a PCR experiment using Q5® High-Fidelity 2X Master Mix? My template is GC rich or supercoiled. How can I optimize my product yield using Q5® High-Fidelity Master Mixes? There is a precipitate in the bottom of the Master Mix tube? Is this normal? I have a tube of the Q5® High GC Enhancer from another product formulation - can I add it to the Q5 Master Mix? What are the stability and storage requirements of the Q5® Master Mixes?